The beautiful lady pictured above is an upcoming Yoruba actress named Janet Atayero Oluseye. The talented movie star got married last year at the age of 31 before joining Nollywood. Before her sudden death last week, she was a member of ANTP Ibadan chapter. She worked with Ojopagogo movie caucus in Ibadan until her death. 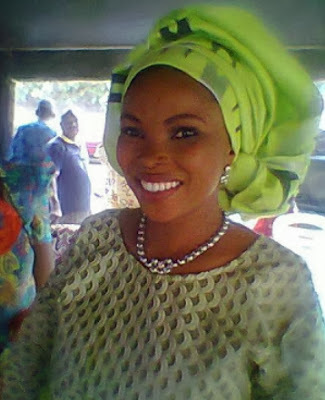 The actress who married Mr Olalekan Oluseye in style last year died this past Wednesday at the age of 32. Sources claim she died of an apparent spiritual attack. Janet was said to have complained of minor pains on her foot on a movie set few months ago. The attack left her in a bad health state after she was unable to work for months. She was treated at the hospital and later transferred to a spiritual care center but all efforts to get her well proved abortive. Janet Atayero Oluseye eventually lost the battle to the attack that left her incapacitated for months. She was buried in Lagos last week Wednesday. May her soul rest in perfect peace (amen).